During the first decade of this new millennium, it is estimated that more than €100 billion will be invested in the third generation (3G) Universal Mobile Telecommunications System (UMTS) in Europe. This fact represents an amazing challenge from both a technical and commercial perspective. 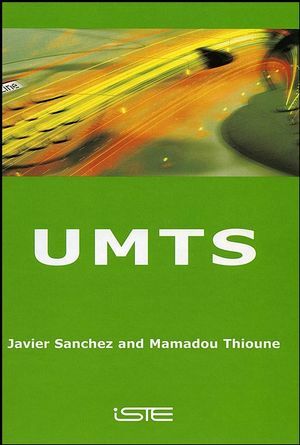 Written by experts in the field, this book gives a detailed description of the elements in the UMTS network architecture: the User Equipment (UE), the UMTS Radio Access Network (UTRAN) and the core network. The completely new protocols based on the needs of the new Wideband Code Division Multiple Access (WCDMA) air interface are highlighted by considering both Frequency- and Time-Division Duplex modes. The book further introduces the key features of existing topics in Releases 5, 6 and 7. Javier Sanchez obtained a PhD degree in the French Scientific Research Centre (CNRS) in the field of Array Signal Processing. He then acquired a solid experience in mobile communication systems from more than 8 years' experience in different mobile phone manufacturers including Philips, Alcatel and NEC. At LG Electronics Mobile Phone Division, Dr. Sanchez is currently senior manager and responsible for validating 2G/3G mobile terminals intended for the European market. Mamadou Thioune graduated from Ecole nationale supérieure des télécommunications (ENST) de Bretagne, in France. His previous experience includes serving as telecom consultant for SIVAN company, and as a software architect and UMTS standardisation expert for Alcatel Business Systems. He is at present Engineer at STMicroelectronics.